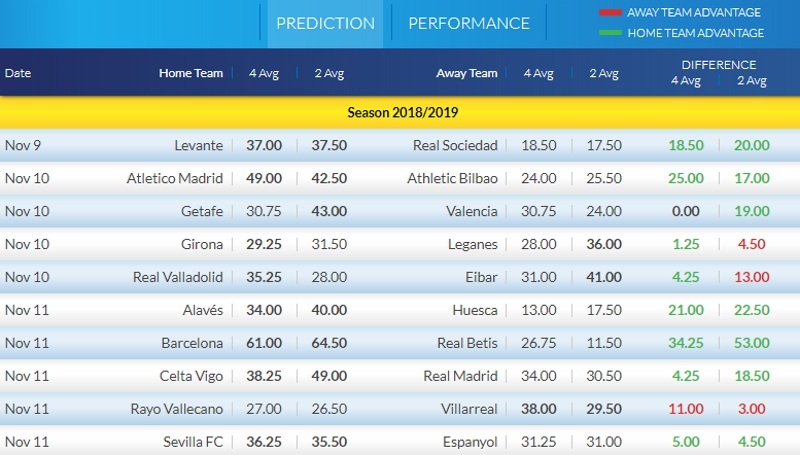 Here are the last batch of odds and ratings from La Liga before the dreaded international break kicks in. Browse through them all and then tell us what bets you're slamming down this weekend! Bookies, we're coming for ya! Levante have scored in each of their last 7 matches in La Liga. Levante have scored 2 goals or more in each of their last 4 home matches in La Liga. My preview in La Liga was one that seemed an obvious choice given the past meetings between the two sides. When Atletico Madrid play Athletic Bilbao in a 5:30pm kick-off this Saturday at the Wanda Metropolitano it feels like there can only be one winner. Atletico Madrid had a rocky start to the season with just 1 win in their first 4 matches. It was a crash back down to earth after their stunning UEFA Super Cup victory over rivals Real Madrid. However, since the 2-0 defeat away to Celta Vigo back on 1st September, Diego Simeone's side have gone undefeated and have conceded just 3 goals during the process. That's 3 goals over 8 league games. That means they're conceding an average of 1 goal every 240 minutes of league action. Athletic Bilbao have had reverse fortunes. Eduardo Berizzo's men started the season well with a dramatic 2-1 win over Leganes and remained undefeated for their first four league matches. Unfortunately, form has suffered a downturn since with the club failing to win since that opening game. That being said, they have still only lost 3 games this season so they remain a tough side to break down. This game pits 4th placed Atletico against 17th placed Bilbao. 10 points separate them in the league but this will be far from a comfortable game for the home side. Atletico do have a very good record against their opponents here having won 10 and drawn 2 of the last 12 meetings. If you wanted more proof of Simeone's side's defensive capabilities then they are the only team in the top five European leagues that are yet to concede a goal in the first half of a game. Simeone has also won 13 matches against Bilbao in all competitions. That's his best record against any team he has come up against in his managerial career. I think backing Atletico Madrid to win is clear here. The outright doesn't offer much value but backing the home side to win to nil and leading by half-time are the bets worth backing. One cheeky bet is also backing Diego Costa to score anytime. He is without a goal in 17 league appearances but he has scored in each of his last three meetings with Bilbao. @Pep004, @Magic0024, @betcatalog, @malabgd, @AndreBR, @Xcout, @four-leaf, @sajtion, @Arkadi Manucharov, @Jamesboaz, @RealUnited, @allyhibs, @jazzman02, @Mr.Paul, @notanotherdonkey, @Marek76, @freestylerx, @DonPaulo, @fhuefdsa, @laprikon, and @derbent, what bets with you guys be placing this weekend? 82% of Valladolid's matches had under 2.5 goals in La Liga. 75% of Real Madrid's goals have been scored in the second half in La Liga. FC Barcelona conceded at least 1 goal in each of their last 5 home matches in La Liga. Alaves have scored in each of their last 9 matches in La Liga. Huesca have failed to win in their last 10 matches in La Liga. 88% of Real Betis's goals have been scored in the second half in La Liga. 100% of Granada's conceded goals occured in the second half in La Liga2. 80% of Las Palmas's conceded goals were conceded away in La Liga2. 77% of Reus's matches had under 2.5 goals in LaLiga 2. Extremadura conceded at least 1 goal in each of their last 13 matches in LaLiga 2. Zaragoza conceded at least 1 goal in each of their last 9 matches in LaLiga 2. 50% of Mallorca's conceded goals occurred in the first 15 minutes in LaLiga 2. Gimnastic conceded at least 1 goal in each of their last 8 matches in LaLiga 2. 77% of Numancia's matches had under 2.5 goals in LaLiga 2. 87% of Cordoba's goals have been scored in the second half in LaLiga 2. Lugo have scored 27% of their goals in the first 15 minutes in LaLiga 2. 85% of Alcorcon's matches had under 2.5 goals in LaLiga 2. Cadiz conceded at least 1 goal in 100% of their away matches in LaLiga 2. 69% of Almeria's matches had under 2.5 goals in La Liga 2. 44% of Deportivo's conceded goals occurred after the 75th minute in La Liga 2. 31% of Almeria's conceded goals occurred after the 75th minute in La Liga 2. Deportivo have been undefeated in their last 8 matches in La Liga 2. Almeria have scored 2 goals or more in each of their last 4 home matches in La Liga 2.